New HDX1000 HDTV Design! Directional HDTV/VHF/UHF antenna has an Internal 10 dB low noise amplifier, and Includes adjustable offset mast/mount. With its 20" width, this antenna mounts almost anywhere! 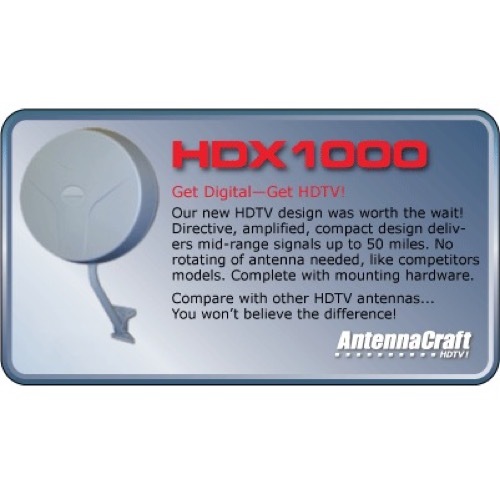 Expertly engineered to target digital broadcasts, that HDX1000 delivers the crisp, clear signals of off-air HDTV, and best of all, there's no rotation needed to receive VHF band, like similar competitor's models. The HDX1000offers solid, reliable HDTV reception. Physical Dimensions: 18" x 20" x 4"